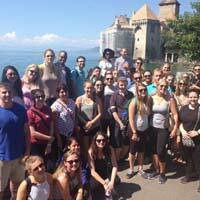 Students in Geneva experienced the annual orientation trip to the historic island castle, Chateau du Chillon. Last weekend's orientations activities for new undergraduate and transfer students continued at several Webster campuses with "Welcome Week" events to help these students better know Webster -- and each other. Orientation is a critical part of students' introduction to Webster, as it familiarizes them with services, locations and the people around campus who can ease their transition. Informational sessions tailored for parents, transfer students, international students and other audiences are also part of the program. Below see -- and share on social media with the hashtag #new2webster -- a variety of photos and short video clips that give a taste of what new students experience. 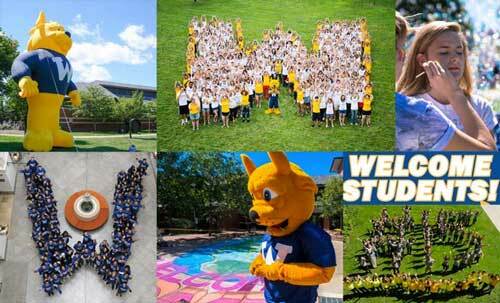 New Student Orientation and welcome events around the world! Staff, faculty and returning students welcomed hundreds of new and transfer undergraduates and graduate students to Webster for New Student Orientation, while Welcome Week extended the activities to all students experiencing their first week of fall classes. Among the highlights were the annual forming of the "W" in the quad (see video here), plus making tie-dye shirts and face paint, competing in human bubble games on the Quad, all with the backdrop of a chalk globe mural composed by Chalk Riot while a bubble bus filled the air with soap bubbles. Check those links for more on Facebook, follow @websteru on Twitter for other photos, and check out the @mywebsteru Instagram for a look from the eyes of students. In Vienna, 73 new undergraduate students and their parents learned about academic and student support services as they got to know Webster's Vienna campus. Among the bonding activities for these students was a zipline trip and a visit to Vienna's famous Prater public amusement park, which is located in the same 2nd district as the Vienna campus' Palais Wenkheim. They also joined the tradition of forming a human "W" in the Palais Wenkheim (see video above). See and share photos from Vienna orientation activities in this Facebook album, and find more at Webster Vienna. In Geneva, students visited Chateau du Chillon, the historic island castle on Lake Geneva. Among the students beginning 2015-16 in Geneva this year are 43 study abroad students -- a fall term high for the campus. See students at Webster Geneva form a "#15" on the lawn in this video on YouTube. All students were also treated to a week one barbecue. Check out more photos from their orientation activities in this Facebook album. 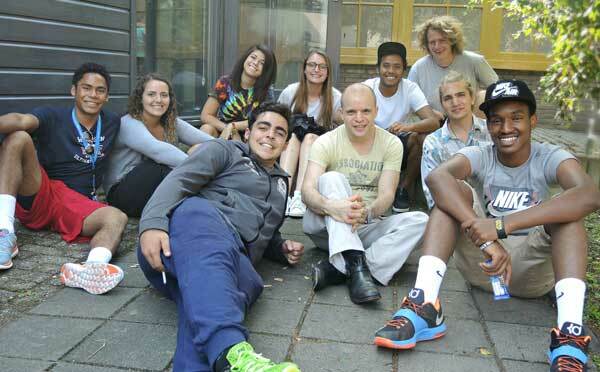 Students experience orientation at Webster Leiden's Living and Learning Center. Webster Leiden's orientation included 83 new undergraduate, graduate and study abroad students, with staff treating them to a barbecue, art and music in the courtyard of the Living and Learning Center. See photos of those activities in this album on Facebook.